Zabec.net Review 2019: Is Zabec.net a Good Hosting? Zabec.net is a long standing Slovenian company using SSD storage. The lower tier plans are comprehensive and well priced, however, the higher end packages are overpriced. Zabec.net, founded in 2003, is according to its website, the “craziest, most creative, and innovative agency for online communication in Europe”. An usual statement, which I can’t verify, but I can tell you it’s located in Slovenia and is part of a larger “Frog” family which includes SPRD.digital (a website development team), DAT-IT (data center services) and Presentia (another hosting company). 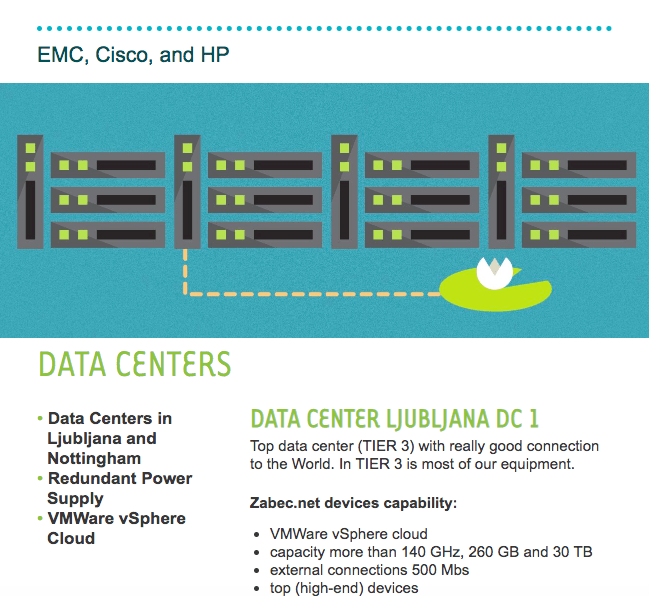 Zabec.net co-locates its servers in one Tier III data center and one Tier II center, both located in Ljubljana, Slovenia. I always prefer to see companies that own their own centers, however, it’s great to see use of a Tier III center, which should mean less than 1.6 hours of downtime per year (of course, the servers in the Tier II center will have a lower downtime). The uptime guarantee is a little unusual. Although it’s advertised as 99.99% service availability, I contacted Zabec.net to find out if this was guaranteed. According to Zabec.net’s live chat operator, the actual SLA is provided by partner company DAT-IT. The plans use cPanel or DirectAdmin as the control panel and branded hardware like Cisco, EMC, VMware, HP, and Fujitsu, in redundant environment. The network is IPv6 ready, if that’s important to you. In terms of value added features, the plans come with support for PHP versions 5 through 7, MySQL databases, and developers will enjoy SSH access, Git, and Cron jobs. For ease of use, you can install common CMS programs with one-click (e.g. WordPress, Joomla!, and Magento) and the team will help you migrate your website over for free. There’s a wide range of prices, which is a little odd considering the features remain the same and only the resources change. The lowest package is cheap, but does not have enough resources to make it viable, however, the second cheapest package has both a good price and enough resources for most everyday website owners. The higher tire packages get overly expensive. The plans can be purchased in terms ranging from one month to two years. There isn’t a discount for purchasing a longer term upfront and, in fact, if you purchase anything over one year term, the monthly price increases as you no longer benefit from the initial discount. There’s a 15-day money-back guarantee. Customer service is by phone, email, and live chat, from 9:00 a.m. to 8:00 p.m. (although strangely, it mentions 24/7 support on the same page). The average response time to inquiries is advertised as 30 minutes. I contacted the team via live chat midday on a Wednesday. The operator picked up straight away and answered my questions in full and in English. They did direct me to address further questions to the email address, though for what reason, I am not sure. Zabec.net reportedly transfers more than 50,000GB of data per month to its existing 6,500 clients. The plans use SSD and have a 99.99% service availability, however, the higher-tier plans are expensive, with the lower packages offering much better value for money. Wondering how Zabec.net stacks up against other Web Hosting companies? Enter any other Web Hosting company and we will give you a side-by-side comparison.